Last Sunday, the bf and I went to Little Tokyo to satisfy our Shabu Shabu cravings. I was glad that the weather was cool enough for me to wear this faux-fur vest again. 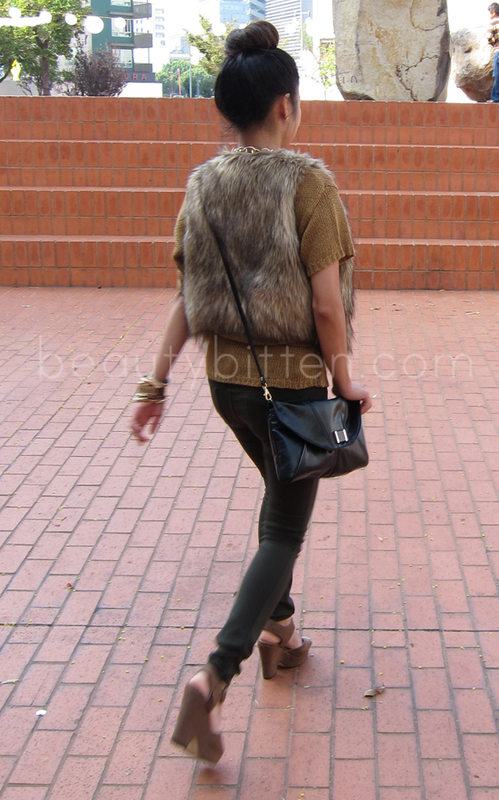 Like I mentioned in my previous post, this faux fur vest is a definite staple item for me this Fall. It's just another fun way to add texture and layers to your outfit. And it's also incredibly soft. I find myself petting this vest once in awhile. But can we talk about these pants right now? Overall Thoughts: When the whole "jeggings" idea first came out, I wasn't sure how I felt about them. I mean I love jeans and leggings, but as a separate entity. But then what is this? Leggings with with pockets and zipper in them? How can they still be leggings? Aren't they technically pants? But that didn't really matter anymore once I slipped these on. They are by far my most comfortable snug pants ever! I can seriously sleep in them. The material is thick, but lightweight and breathable. I can easily do the splits in these if I knew how. I really love how it hugs my body and doesn't flatten my tush (a skinny like me needs all the help I can get in that department). It's just really comfortable like you're wearing clouds on your bottom is the best way I can describe it. The fabric is just super soft. I'm normally a size 0 or 00, depending on the brand (for reference, I'm 5'1 with a 24" waist). I bought these pants in size 00, and they fit like a glove. The length is a little long, but not super long that I'll need to get it hemmed. And, I haven't experienced any scrunching in the crotch area (heh). The pants will shrink a teeny bit after washing it, but not to the point where you can't fit in them anymore. They stretch back out again after you've worn them. I also really love it's olive color because a perfect color for fall! I think this is the first outfit that I decided to play with the textures. I have the furry, chunky, suede, and cotton elements going on in this picture. This is why I love the cooler weather! You have more options when it comes to layering pieces. As for my necklace, I bought this at H&M two years ago when I went to Boston. I wasn't quite sure what to do with it then, but I bought it anyway. Thank goodness I finally found a way to wear it. It's a really long chain necklace and I just looped it around my neck twice to make it a shorter piece. So digging it. By the way, thank you to everyone who appreciates my style post. It really warms my heart to hear it from you guys. I'm glad that I can share my "dress rehersals" and inspire some of you with my post. This whole documenting my outfits has also help me figure out my own personal style and to be inspired by other as well. Thank you for reading my blog :). Thoughts: What is your staple piece this Fall? i wanna pet you! & i love the chunky gold necklace. I'm sooo loving your outfit, especially the leggings!